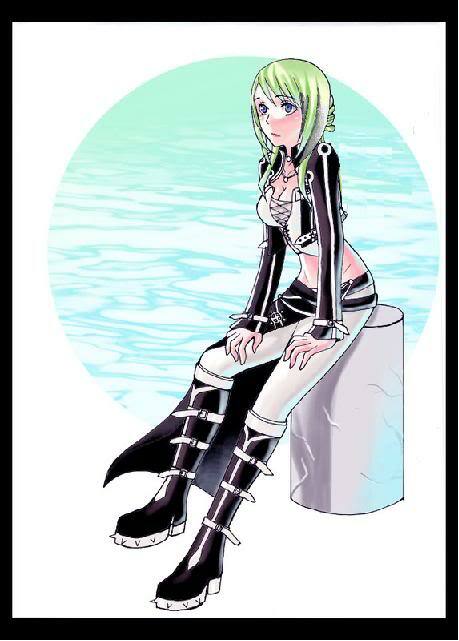 Appearance: Although usually keeping it green, Trip dyes her hair once a month, and always keeps it short. If she's feeling an extreme emotion, her eyes change color. They are usually dark blue. She has slight abs and is well toned. She never shows her wings for 2 reasons: 1) She just doesn't like them 2) Since she is only half demon, they breaks the skin when they come out. Preferences: Abnormally colored slightly shaggy hair, thin and not extremely muscular guys. She doesn't like the guys who date just about any girl they see. Likes: Drawing, computers and programming, dancing and working out, getting good grades, being out at night, music, colorful candy, HOT TOPIC. Dislikes: Drama, snooty people, cheaters, slackers, morons, sleeping, procrastinating, getting bad grades. History: Trip's mother was a demon. Literally. She was murdered when Trip was 11. Trip's father is human, and despises her for how much she reminds him of her mother. He was a drunk, so Trip wasn't too terribly upset when he sent her to Nexus so he wouldn't have to deal with her. From a young age it became apparent that Trip was special. Not only did she inherit some of her mothers powers, (she can bring out her wings, as well as give and take people's emotions. The latter of the two has its limitations) but she it also very intelligent. She could solve complex equations in less then a second, and memorize pages of information in an hour, however; she was never good at history. Trip's second boyfriend didn't end well. One night she accidentally transferred all of her emotions into him. He had a heart attack due to the overload. He lived, but he is still in a coma. She hasn't dated since then, out of fear of hurting anyone else. She is still waiting for the certain someone to be the exception.